Love this Thai noodle salad! I needed to use up a few things in my fridge, so to do that I made this Thai noodle salad. It’s super yummy, raw and very nutritious! Vegetables are most nutritious in their raw state. 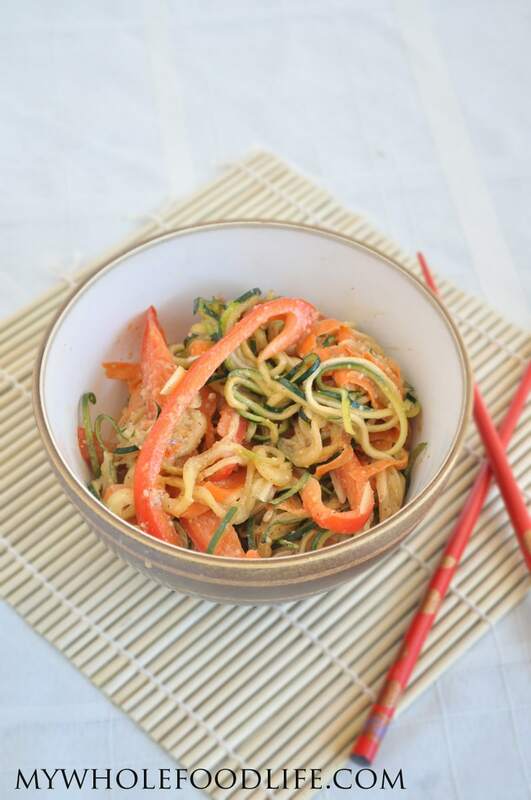 I used my spiralizer to make this Thai noodle salad. I just love that thing! This healthy salad is also grain free. I used zucchini for the “noodles.” If you like this, you may also like my zucchini pasta with avocado pesto. I used my Thai Peanut Sauce for the dressing. I was out of peanut butter, so I used almond butter and it worked out great. I highly recommend keeping the vegetables and the dressing separate until you are ready to eat the salad. Spiralized vegetables can release moisture making the dressing too thin and soupy. A healthy salad that will energize you! Using a spiralizer , cut the zucchini and cucumber into spirals. Using a peeler , peel the carrots into ribbons. Add them to a bowl with the remaining salad ingredients. In a small blender, mix the ingredients for the dressing. Once ready to eat, pour the dressing over the salad and enjoy! If you like, you could always add your favorite protein to this dish. I know tofu would go well. Edamame would also be good on this. I highly recommend keeping the dressing and the vegetable separate until you are ready to eat. The vegetables can release water that might make the salad soupy. This should keep in the fridge for at least 5 days. Enjoy! That looks easy enough and really tasty. I’m going to try it. I love this! Great way to use up some lingering vegetables! I don't have coconut aminos however, what would be a good substitute? Thanks! You can use tamari, bragg's aminos or soy sauce. This sounds delicious. I think I would add some grilled chicken chunks to make it a whole meal salad. I also like the idea of adding edamame. This kind of recipe is great for when I don't have a stove (we don't have a stove when we're at the beach) - and my spiralizer is a tool that will continue to make the trip to the beach because it is so useful. Looking forward to trying this. Thank you! I hope you enjoy it. If I had edamame, I would have added it for sure. Oh yum! This is definitely dinner tonight!! I love when I already have the ingredients on hand. Can't wait to try this. You're welcome! I hope you enjoy the recipe. This was delicious! Will be making it again soon! Can I use peanut butter instead of almond butter in the dressing? Thanks Melissa for this great post. I like the way you organize things and present the recipe with simple instructions. I ate Thai salad once in a local pub and it was amazing, so I will be eager to try doing it myself using your wonderful recipe. Thanks again.